K 4 Compact Home 16373130 https://www.kaercher.com/ae/home-garden/pressure-washers/k-4-compact-home-16373130.html "K4 Compact Home" high-pressure cleaner with water-cooled motor: mobile and easy to store. With T 350 and stone and facade cleaner. For removing moderate dirt (e.g. fences or vehicles). "K4 Compact Home" high-pressure cleaner with water-cooled motor: mobile and easy to store. With T 350 and stone and facade cleaner. For removing moderate dirt (e.g. fences or vehicles). Home, sweet Home: the "K4 Compact Home" high-pressure cleaner with water-cooled motor - for cleanliness around the home! This machine is compact with two handles and a telescopic handle - for easy transport and space-saving storage. 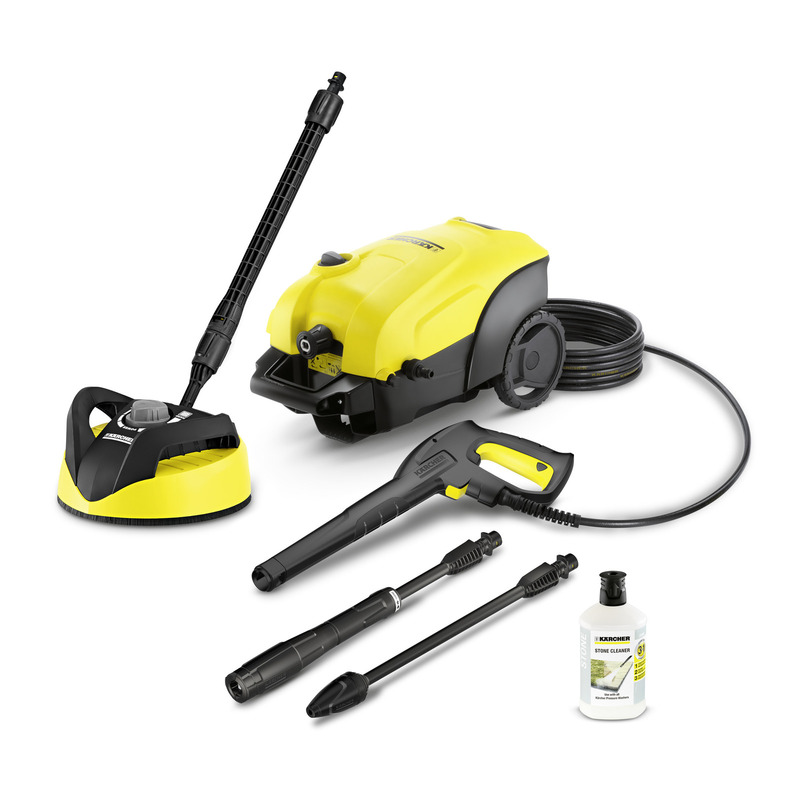 The extra Home Kit contains the T 350 surface cleaner for splash-free cleaning of large areas and 3-in-1 stone and facade cleaner (1l). This machine also features a Quick Connect gun, 6 m high-pressure hose, Vario Power spray lance (VPS) with twist action pressure regulation, dirt blaster with powerful rotating pencil jet for removing stubborn dirt and water filter for pump protection. In brief: the ideal machine for occasional removal of moderate dirt, e.g. on vehicles, fences and bicycles. The small, robust devices in the Compact range have two carrying handles and can easily be taken with you, wherever you go. All Kärcher high-pressure cleaner equipment includes an integrated suction mechanism for cleaning agents.